Forget hotels. Get a Dolphins Cove timeshare rental for your Disneyland vacation. Why get Dolphins Cove timeshare rental? Because you've been planning your Disneyland vacation for a long time. You want everything to be perfect. Read the life and times of one family's Dolphin's Cove vacation. As a timeshare owner, I have access to Worldmark Dolphin's Cove, a wonderful, spacious hotel alternative, located just three city blocks from Disneyland. Where is the Worldmark Dolphin's Cove? Where is the Dolphins Cove timeshare rental? What else is there to do in Anaheim -- and Los Angeles -- while staying at the Dolphins Cove timeshare rental? 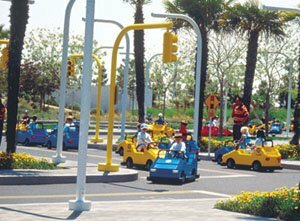 Within a 60-mile radius of the Dolphins Cove timeshare rental youll find Disneyland, Disneys California Adventure Park, Knotts Berry Farm, Universal Studios Hollywood, Universal CityWalk and LEGOLAND; head another 30 miles south to enjoy SeaWorld San Diego, the San Diego Zoo and the San Diego Wild Animal Park. For a beach fix, surfing mecca Huntington Beach and chic Laguna Beach are less than 20 miles away. 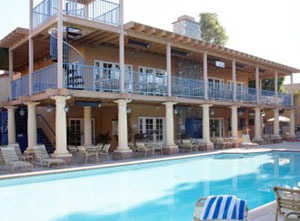 Angel Stadium is located just a few miles east from the Dolphins Cove timeshare rental. Practically across the street from the Stadium on the Honda Center, where you can watch the Anaheim Ducks! You can visit the Crystal Cathedral, just a couple miles south from the Dolphins Cove timeshare rental in Garden Grove. And of course, Southern California is famous for its beaches. Anaheim's closest beach is Seal Beach, about 16 miles west. Combining world-renowned beaches with countless options for activities, entertainment and sightseeing, Anaheim offers a vacation destination that guarantees something for everyone. What restaurants are near the Dolphins Cove timeshare rental? You'll find everything to awesome steak houses to fast food, walking distance from Dolphins Cove. See the list of restaurants near Dolphins Cove, plus reviews! What is the Dolphins Cove timeshare rental like? I hestitate calling this "walking distance" because different people have different definitions for walking distance. It's just-over-a-mile from the Dolphins Cove timeshare rental to Disneyland, a distance that is definitely walking distance for me, which is great because it saves me from having to park at Disneyland. Have a hard time getting around? Be sure to check out my article on renting a wheelchair at Disneyland. 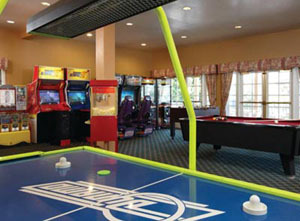 WorldMark Dolphins Cove is located just about a mile away from southern California's family fun favorites, Disneyland and Disneys California Adventure Park, located inside of Anaheim's resort Area, a lushly landscaped 2.2-square-mile center of entertainment and hospitality. 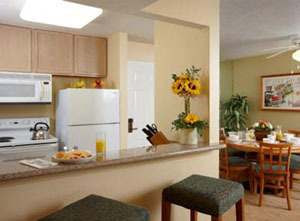 You can expect the most familiar WorldMark amenities at the Dolphins Cove timeshare rental: a fully equipped kitchen (including our signature six spices), balcony or patio, TV with VCR, stereo with CD player, telephone, hairdryer, iron and ironing board. Outside, palm trees, water features and resort facilities - including pools, a spa, playground, fitness center and game room - await you. What are the rooms like at the Dolphins Cove timeshare rental? 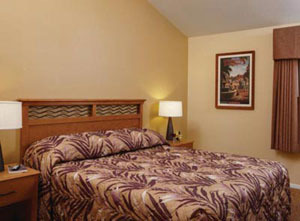 What types of rooms are available at the Dolphins Cove timeshare rental? 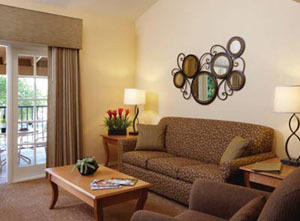 Worldmark Dolphin's Cove has many different unit sizes to accommodate most parties. If you have an large party, consider renting multiple units. Three Bedroom: King in master, queen in second, twins in third bedroom, sleeper sofa in living area. Two bathrooms. Maximum occupancy 8. Two Bedroom: King in master, twins in second bedroom, sleeper sofa in living area. Maximum occupancy 6. Two Bedroom / one Bath: This unit has a king bed in the master bedroom, two twin beds in the second bedroom and a queen sofa bed in the living room. This unit only has one bathroom. Maximum occupancy 6. One Bedroom / one Bath: King in master, sleeper sofa in living area. Bathroom access via bedroom. Maximum occupancy 4. One Bedroom: Queen in master, sleeper sofa in living area. Bathroom access via bedroom. Maximum occupancy 4. 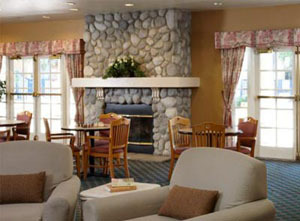 From the moment it joined the WorldMark network in 2004, the resort at Dolphins Cove in Anaheim, California, has enjoyed the status of being one of the most requested destinations among WorldMark owners. With its proximity to Disneyland, Universal Studios, and other family-friendly Southern California attractions, Dolphins Cove units are normally filled to capacity. WorldMark owns weeks, not units, at Dolphins Cove: approximately one-third of the total weeks, with Fairfield Resorts holding the balance. With this atypical arrangement come some unique booking guidelines. The governing documents that manage the existing homeowners association limit vacations to a 12-month booking window, rather than the 13-month window WorldMark owners are accustomed to for a seven-night reservation. In addition, all vacations planned for this resort must begin and end within 12 months of the date they are booked. Book the smallest unit that will accommodate your needs. Larger units are always in higher demand since multigenerational vacations are common here. Avoid booking during high-travel times such as holidays and school breaks. How much will it cost to rent the Dolphins Cove timeshare rental? The Dolphins Cove timeshare rental is popular year-round; all dates are considered to be in the High Season. Rates vary according to the unit size, and according to which days of the week that you're there. "I really enjoyed my stay here while my family and I visited Disneyland. The grounds are beautiful, exceptional service and our unit was super clean! We loved having a kitchen that was well stocked with any appliance that you would need, dishes, pots, pans, etc. There is a large pool, game room, spa and laundry on the premises. "We stayed at Dolphins Cove in September 2010 for 4 nights in a 2 BR, 2 bath unit. We loved the resort, loved the location and would not hesitate to recommend it to anyone. I truly feel if someone doesn't like it, they have a problem of some sort. It was clean, staff was friendly, rooms were so big and I loved a walk in closet (don't have one at home). I liked the fact that the bedrooms were on opposite ends of the unit - providing privacy for all of us. 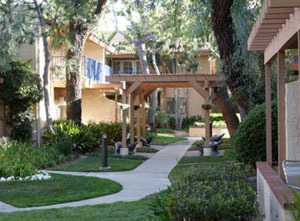 Worldmark Dolphin's Cove is one of my most popular timeshares. It tends to book far in advance. 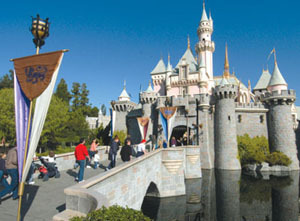 The further out you plan your Disneyland vacation, the greater likihood that your dates will be available! Would you also like me to check the nearby WorldMark Anaheim resort? It's about 1 mile north of this resort.